What facts should I know about pulmonary edema? What are the symptoms of pulmonary edema? What are the risk factors for pulmonary edema? What are the complications of pulmonary edema? What is the treatment for pulmonary edema? When should I seek medical care for pulmonary edema? How can pulmonary edema be prevented? What is the medical definition of pulmonary edema? Pulmonary edema is typically caused by filling of alveoli in the lungs by fluid leaking out of the blood. Pulmonary edema may be caused by a number of cardiac or non-cardiac conditions. Breathing difficulty is the main manifestation of pulmonary edema. What is the best treatment for pulmonary edema? Treatment of the underlying cause of pulmonary edema is an essential step in the management of pulmonary edema. Edema, in general, means swelling. This typically occurs when fluid from inside blood vessels seeps outside the blood vessel into the surrounding tissues, causing swelling. This can happen either because of too much pressure in the blood vessels or not enough proteins in the bloodstream to hold on to the fluid in the plasma (the part of the blood that does not contain any blood cells). Pulmonary edema is the term used when edema happens in the lungs. The immediate area outside of the small blood vessels in the lungs is occupied by very tiny air sacs called the alveoli. 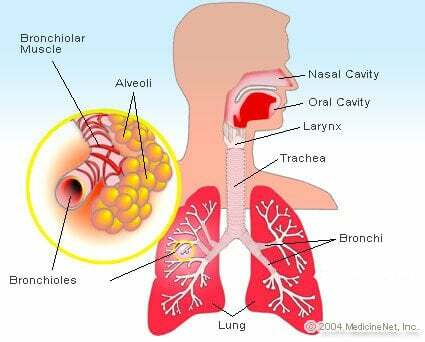 This is where oxygen from the air is picked up by the blood passing by, and carbon dioxide in the blood is passed into the alveoli to be exhaled out. Alveoli normally have a thin wall that allows for this air exchange, and fluids are usually kept out of the alveoli unless these walls lose their integrity. Pulmonary edema occurs when the alveoli fill up with excess fluid seeped out of the blood vessels in the lung instead of air. This can cause problems with the exchange of gas (oxygen and carbon dioxide), resulting in breathing difficulty and poor oxygenation of blood. Sometimes, this can be referred to as "water in the lungs" when describing the condition to patients. Pulmonary edema can be caused by many different factors. It can be related to heart failure, called cardiogenic pulmonary edema, or related to other causes, referred to as non-cardiogenic pulmonary edema. The most common symptom of pulmonary edema is shortness of breath or breathlessness. This may be of gradual onset if the process slowly develops, or it can have a sudden onset in the case of acute pulmonary edema. Other common symptoms may include easy fatigue, more rapidly developing shortness of breath than normal with usual activity (dyspnea on exertion), rapid breathing (tachypnea), dizziness, or weakness. Low blood oxygen level (hypoxia) may be detected in patients with pulmonary edema. Furthermore, upon examination of the lungs with a stethoscope, the doctor may listen for abnormal lung sounds, such as rales or crackles (discontinuous short bubbling sounds corresponding to the splashing of the fluid in the alveoli during breathing). The risk factors for pulmonary edema are essentially the underlying causes of the condition. There isn't any specific risk factor for pulmonary edema other than risk factors for the causative conditions. As mentioned earlier, pulmonary edema can be broadly divided into cardiogenic and non-cardiogenic causes. Some of the common causes are listed below. Cardiogenic causes of pulmonary edema results from high pressure in the blood vessels of the lung due to poor heart function. Congestive heart failure due to poor heart pumping function (arising from various causes such as arrhythmias and diseases or weakness of the heart muscle), heart attacks, or abnormal heart valves can lead to accumulation of more than the usual amount of blood in the blood vessels of the lungs. This can, in turn, cause the fluid from the blood vessels to be pushed out to the alveoli as the pressure builds up. Acute respiratory distress syndrome (ARDS), a potentially serious condition caused by severe infections, trauma, lung injury, inhalation of toxins, lung infections, cocaine smoking, or radiation to the lungs. In ARDS, the integrity of the alveoli become compromised as a result of underlying inflammatory response, and this leads to leaky alveoli that can fill up with fluid from the blood vessels. Kidney failure and inability to excrete fluid from the body can cause fluid build-up in the blood vessels, resulting in pulmonary edema. In people with advanced kidney disease, dialysis may be necessary to remove the excess body fluid. High altitude pulmonary edema, which can happen due to rapid ascent to high altitudes of more than 10,000 feet. Brain trauma, bleeding in the brain (intracranial hemorrhage), severe seizures, or brain surgery can sometimes result in fluid accumulation in the lungs, causing neurogenic pulmonary edema. A rapidly expanding lung can sometimes cause re-expansion pulmonary edema. This may happen in cases when the lung collapses (pneumothorax) or a large amount of fluid around the lung (pleural effusion) is removed, resulting in rapid expansion of the lung. This can result in pulmonary edema on the affected side only (unilateral pulmonary edema). Rarely, an overdose on heroin or methadone can lead to pulmonary edema. Aspirin overdose or chronic high dose use of aspirin can lead to aspirin intoxication, especially in the elderly, which may cause pulmonary edema. Other more rare causes of non-cardiogenic pulmonary edema may include pulmonary embolism (blood clot which has traveled to the lungs), transfusion-related acute lung injury (TRALI), some viral infections, or eclampsia in pregnant women. Most complications of pulmonary edema may arise from the complications associated with the underlying cause. More specifically, pulmonary edema can cause severely compromised oxygenation of the blood by the lungs. This poor oxygenation (hypoxia) can potentially lead to diminished oxygen delivery to different body organs, such as the brain. Pulmonary edema is typically diagnosed by a chest X-ray. A normal chest radiograph (X-ray) consists of a central white area pertaining to the heart and its main blood vessels plus the bones of the vertebral column, with the lung fields showing as darker fields on either side, enclosed by the bony structures of the chest wall. A typical chest X-ray with pulmonary edema may show a more white appearance over both lung fields than usual. More severe cases of pulmonary edema can demonstrate significant opacification (whitening) over the lungs with minimal visualization of the normal lung fields. This whitening represents filling of the alveoli as a result of pulmonary edema, but it may give minimal information about the possible underlying cause. To identify the cause of pulmonary edema, a thorough assessment of the patient's clinical picture is essential. A careful medical history and physical examination often provide invaluable information regarding the cause. Other diagnostics tools used in assessing the underlying cause of pulmonary edema include the measurement of plasma B-type natriuretic peptide (BNP) or N-terminal pro-BNP. This is a protein marker (a hormone) that will rise in the blood due to the stretch of the chambers of the heart. Elevation of the BNP nanogram (one billionth of a gram) per liter greater than a few hundred (300 or more) is highly suggestive of cardiac pulmonary edema. On the other hand, values less than 100 essentially rule out heart failure as the cause. More invasive methods are occasionally necessary to distinguish between cardiac and noncardiac pulmonary edema in more complicated and critical situations. A pulmonary artery catheter (Swan-Ganz) is a thin, long tube (catheter) inserted into the large veins of the chest or the neck and advanced through the right-sided chambers of the heart and lodged into the pulmonary capillaries (small branches of the blood vessels of the lungs). This device has the capability of directly measuring the pressure in the pulmonary vessels, called the pulmonary artery wedge pressure. whereas a wedge pressure of less than 18 mmHg usually favors a non-cardiogenic cause of pulmonary edema. A Swan-Ganz catheter placement and data interpretation is done only in the intensive care unit (ICU) setting. The treatment of pulmonary edema largely depends on its cause and severity. Most cases of cardiac pulmonary edema are treated by using diuretics (water pills) along with other medications for heart failure. In some situations, appropriate treatment can be achieved as an outpatient by taking oral medications. If the pulmonary edema is more severe or it is not responsive to oral medications, then hospitalization and the use of intravenous diuretic medications may be necessary. The treatment for noncardiac causes of pulmonary edema varies depending on the cause. For example, severe infection (sepsis) is treated with antibiotics and other supportive measures, or kidney failure needs to be properly evaluated and managed. Oxygen supplementation is necessary if the measured oxygen level in the blood is too low. In serious conditions, such as ARDS, placing a patient on a mechanical breathing machine is necessary to support their breathing while other measures are taken to treat pulmonary edema and its underlying cause. Medical attention should be sought for anyone who is diagnosed with pulmonary edema of any cause. Many causes of pulmonary edema require hospitalization, especially if they are caused acutely. In some cases of chronic (long term) pulmonary edema, for example, with congestive heart failure, routine follow-up visits with the treating doctor may be recommended. Most cases of pulmonary edema are treated by internal medicine doctors (internists), heart specialists (cardiologists), or lung doctors (pulmonologists). In terms of preventive measures, depending on the cause of pulmonary edema, some steps can be taken. Long-term prevention of heart disease and heart attacks, slow elevation to high altitudes, or avoidance of drug overdose can be considered preventive. On the other hand, some causes may not completely avoidable or preventable, such as ARDS due to an overwhelming infection or a trauma. Sovari, AA, MD. "Cardiogenic Pulmonary Edema." Medscape. Updated: Dec 22, 2016. "http://emedicine.medscape.com/article/157452-overview"